These teletubbies accompanied us through the day, as my default desktop background that was projected on the wall between presentations. I photographed the objects themselves at the anthropological Tropenmuseum in Amsterdam. 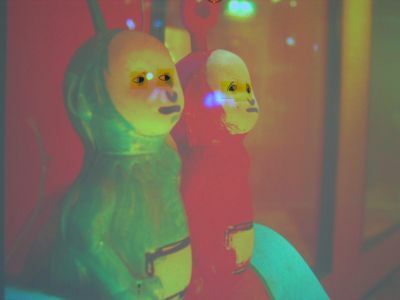 They are wooden hand-made (you can see the brush-strokes) copies of Dipsy and Po of the Teletubbies, and were found being sold by a Javanese street trader. They’re standing on a traditional toy chariot. I find it interesting that these children’s characters are so well-known that they displace culturally traditional demons and other figures, and end up occupying the same niche (I also find this reassuring). I wonder what stories are told about them. We drew the eyes on post-it notes and stuck them on the wall over the projected image. This is a photograph of that.